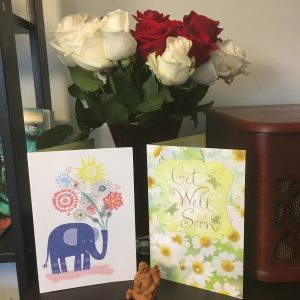 In January, I faced a serious health issue and am now healing. I’m sharing this because a friend told me about her own serious health concerns. She hadn’t shared because she didn’t know how people would treat her. I don’t want to be part of that societal silence. So thank you to my co-workers and family for the care you showed. And thank you, everyone else, for allowing me to be human. If you need to talk about health or pain or how it changes you I’m here to listen. Happy Halloween! Joyous Samhain! A Blessed Día de Los Muerto! My house has been decorated for almost a month the a six ft spider’s web hung by the door, a window dressed with glowing flames, a pair of ghosts on the garage, and a trio of jack’0’laterns on the porch. 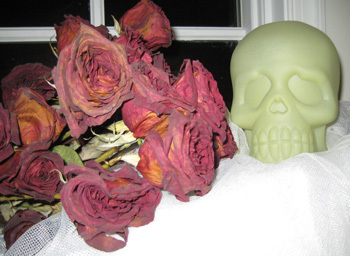 In the highest window my favorite part of the decorations: a single skull and a bouquet of dried roses. The falling leaves always remind me of the people I’ve lost. Tomorrow is the day set aside for them and all the others who have passed. I’ll make their favorite dishes, this year it’s Hungarian chicken paprikash, mashed potatoes, and a homemade apple pie. I set a place at the table for them, a symbol of how I wish I could have one more meal with those people. And I’ll give out candy, too, taking part in the fun side of Halloween, that dancing delight in the fleeting moments of life. My costume is a fairy princess, I’ll take any excuse to wear my wings and a sparkly tiara. Hurricane Sandy rained on my parade, canceling the haunted hayride but it’s still my favorite holiday, the best time of year. However you celebrate I hope your night is exactly how you want it to be. We are natural story tellers. We tell our tales around the kitchen table, with grand gestures that make people laugh or in halting, toneless stammers. Every person recounts something, little or big, how the grocery shopping went, how they lived their life. It’s all a story to be told. Children’s tales of adventure, adult tales of woe, young dreams of success, weave themselves into a tapestry of stories that create our life. Everyone has a story. You may not agree with it, or appreciate it, but it’s there. Some where under the heavy weight of day to day life there’s a dream that makes a tale. Sitting on worn couches, in rooms with the hiss and beep of medical equipment, resting on trees older than you are, it doesn’t matter where you are, you recognize the story – the life song of a person. But all stories must end. Songs may linger, but melodies always fade. Immortality comes in the telling of the tale. The smell of coffee, the laughter of people who never knew you, the worn hands recreating your gestures, they all keep you alive. It’s the stories that keep the people we love alive, and I’m glad to have the tales to tell.